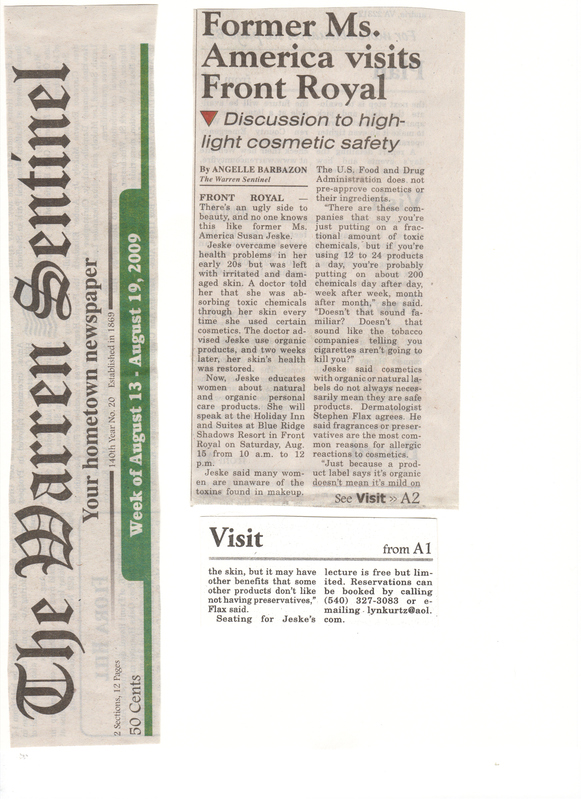 ARE YOUR COSMETICS & PERSONAL CARE PRODUCTS SAFE? 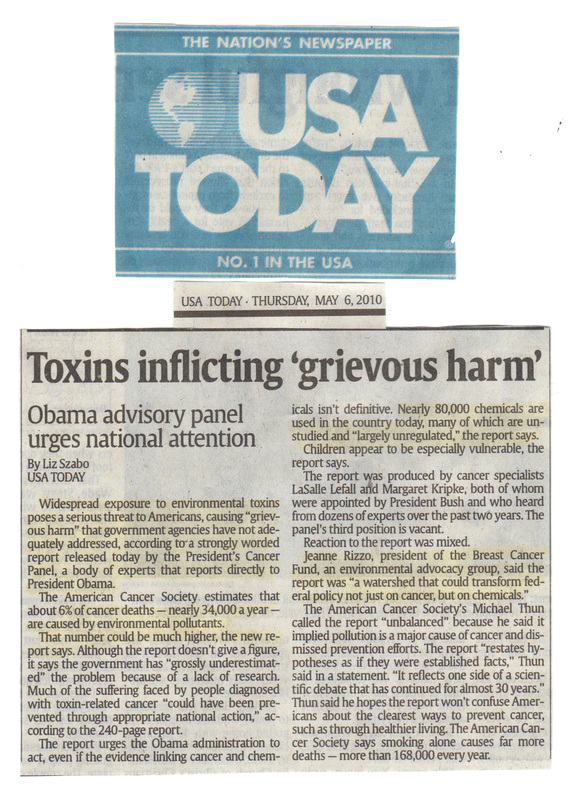 "THE IMPACT OF TOXINS IN COSMETICS AND PERSONAL CARE PRODUCTS AND HOW TO AVOID THEM"
Ø How the FDA is failing to protect our health when it comes to personal care products like shampoo, lotion, conditioner, moisturizer and make-up. Ø Which cosmetic industry-funded panel is currently in charge of reviewing the safety of cosmetics, skin care and personal care item’s. Ø Everyone who attends will receive The Toxic Twelve List - The exact compounds that puts you at the highest risk of biological mutation, reproductive complications, acute toxicity, tumors, skin and eye irritations. Ø What makes cosmetics and skin care the least regulated consumer products on the market. Ø The actual profit margin that cosmetic companies gain by using synthetic and toxic chemicals. Ø What to look for on the label of your personal care products. Ø Recommendations for products that are natural, organic, safe and beneficial. Ø Susan also talks about ECOCERT Certification – an independent third-party certification for “natural” and “organic” claims from Europe. Click Here for the North America Speaking Tour Calendar / Events to see when Susan is coming to a city near you! I have to admit that this presentation was an eye opener for me because up until now I was focusing mainly on organic and natural food without paying a lot of attention to the labels on the skin care products. 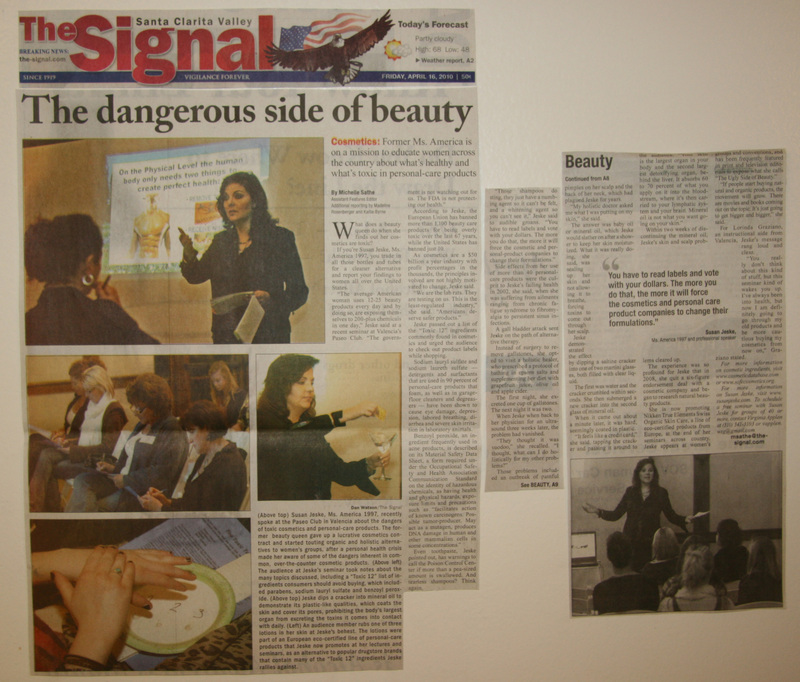 …Before your presentation I didn’t realize what a great effect skin care products have on our bodies! …Please continue educating and inspiring others to take care of their wellness. 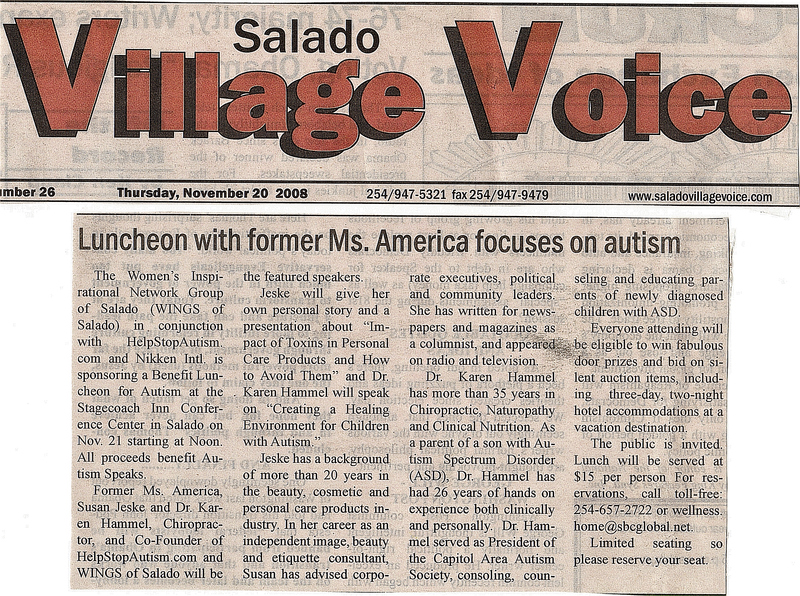 Her program was done professionally, efficiently, effectively and on a level for all to comprehend, relate to and enjoy. I thought The Toxic Twelve List given to us was helpful so that I will be more aware of looking for these when making purchases of personal care products. I liked the suggestions of using specific products that are healthier for people. You also gave good definitions for the word natural and organic labeled on the products which can be confusing to the public consumer….. I was impressed with the honesty of your testimony when you revealed to us... I am currently working as an RN Case Manager for Home care and will try to teach my clients to be more nutritionally minded in regard to a holistic lifestyle. She did an outstanding job of conveying the important details, demonstrating safe alternatives, and sharing her own personal experiences. 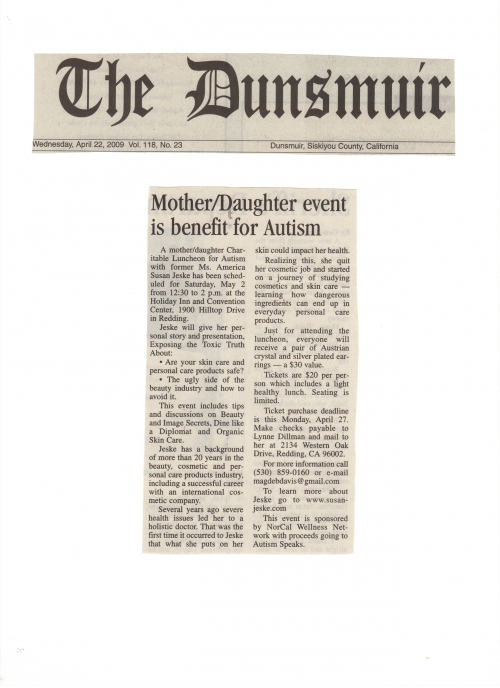 Susan was well prepared and very knowledgeable about this issue. She use’s audience participation, and because she has a bubbly personality, makes it enjoyable for everyone. I have no reservation in recommending Susan. LORAIN — Susan Jeske, former Ms. America, will be speaking Sunday at DeLuca’s Place in the Park, 6075 Middle Ridge Road, Lorain, about toxic cosmetics. The event is hosted by the NEO Events Committee, a group of wellness professionals interested in holistic and wellness issues. The speech is from 1 to 2 p.m. The $10 cost per person includes Sunday brunch with tax and tip included. Registration and brunch is 11:30 a.m. to 2 p.m. Proceeds from a 50/50 raffle and silent auction are being donated to The Keegen Family Foundation. To learn more about her presentation, visit the website at www.SusanJeske.com. 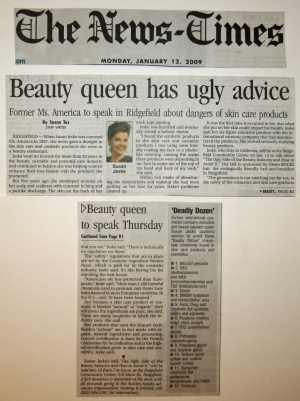 Former Ms. America Susan Jeske knows a thing or two about beauty but her Saturday, April 17 speech has some ugly advice. 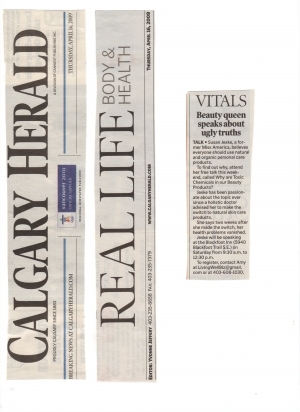 The 48-year-old Californian will discuss the ugly truth behind the beauty industry to raise awareness about the potentially harmful effects of common personal care products. Hosted by the Northwest Ohio Health and Wellness Partners, the event will be held at the Holiday Inn French Quarter in Perrysburg from 9 a.m. to 1 p.m.
Several years ago Jeske suffered from skin problems primarily on her scalp including itching, profuse sweating, scales and puss pockets. Jeske consulted a holistic doctor who asked what she had been putting on her skin. Upon showing him what products she was using, Jeske said the doctor advised she switch to natural and organic products. Within two weeks of switching, Jeske’s longtime skin irritations had disappeared. That still left one unresolved issue: the products Jeske had been using were manufactured by the internationally renowned cosmetics company for which she was among the upper echelon, but preferred to not name. 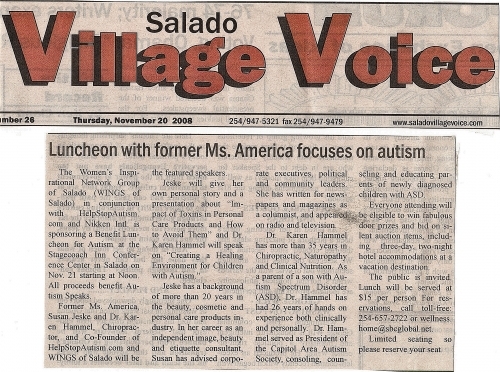 In February of 2008, despite some uncertainties, Jeske gave up her six-figure salary and company car and dedicated her time to advocating her cause. Over the past seven decades, the United States has banned ten chemicals used in cosmetics and skin care products. A concerning number, Jeske said, when compared to Europe’s list of 1,100. But this isn’t just an issue that effects women. Jeske said the average women uses 12 to 24 products, from shampoo to lipstick, per day on her skin and through those products is exposed to 200 chemicals daily. Similarly, the average male uses only six to 12 but is still exposed to 126 chemicals. Consumers should also be aware what cosmetic companies consider “safe” for products. What “safe” means, Jeske said, is that the company has tested the product’s ingredients to determine if they cause rashes, swelling or other acute reactions. What they’re not required to test for are long-term negative health effects. Despite her past experiences, Jeske still loves make-up and uses at least 42 different personal care products daily. All of the products she uses are natural or organic with the exception of mascara which Jeske admits she hasn’t been able to find a well-performing substitute for. “People need to learn how to make safer choices until the government starts watching out for us,” Jeske said. Admission is free but seating is limited. To reserve a spot contact Bob Holmes at (419) 475-9957. Proceeds from the 50/50 raffle will be donated to the Northwest Ohio Affiliate of the Susan G. Komen Breast Cancer Foundation. On July 21, 2010 Congress was introduced to the SAFE COSMETICS ACT OF 2010 (HR 5786), which gives the Food and Drug Administration authority to ensure that personal care products are free of harmful ingredients. CLICK HERE TO READ MORE ABOUT IT. Posted: April 15, 2010 9:38 p.m. 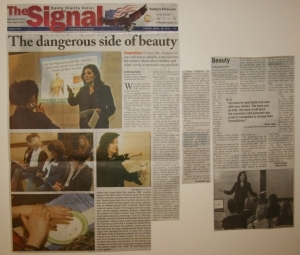 UPDATED April 16, 2010 4:55 a.m.
What does a beauty queen do when she finds out her cosmetics are toxic? If you’re Susan Jeske, Ms. America 1997, you trade in all those bottles and tubes for a cleaner alternative and report your findings to women all over the United States. According to Jeske, the European Union has banned more than 1,100 beauty care products for being overly toxic over the last 67 years, while the United States has banned just 10. As cosmetics are a $50 billion a year industry with profit percentages in the thousands, the principles involved are not highly motivated to change, Jeske said. Jeske passed out a list of the “Toxic 12” ingredients commonly found in cosmetics and urged the audience to check out product labels while shopping. Sodium lauryl sulfate and sodium laureth sulfate — detergents and surfactants that are used in 90 percent of personal-care products that foam, as well as in garage- floor cleaners and degreasers — have been shown to cause eye damage, depression, labored breathing, diarrhea and severe skin irritation in laboratory animals. Even toothpaste, Jeske pointed out, has warnings to call the Poison Control Center if more than a pea-sized amount is swallowed. And tearless shampoos? Think again. Side effects from her use of more than 40 personal-care products were the culprit to Jeske’s failing health in 2002, she said, when she was suffering from ailments ranging from chronic fatigue syndrome to fibromyalgia to persistent sinus infections. A gall bladder attack sent Jeske on the path of alternative therapy. Instead of surgery to remove gallstones, she opted to visit a holistic healer, who prescribed a protocol of bathing in epsom salts and supplementing her diet with grapefruit juice, olive oil and apple cider. The first night, she excreted one cup of gallstones. The next night it was two. When Jeske when back to her physician for an ultrasound three weeks later, the problem had vanished. Those problems included an outbreak of painful pimples on her scalp and the back of her neck, which had plagued Jeske for years. “My holistic doctor asked me what I was putting on my skin,” she said. The answer was baby oil or mineral oil, which Jeske would slather on after a shower to keep her skin moisturized. What it was really doing, she said, was sealing up her skin and not allowing it to breathe, forcing toxins to come out through her scalp. Jeske demonstrated the effect by dipping a saltine cracker into one of two martini glasses, both filled with clear liquid. The first was water and the cracker crumbled within seconds. She then submerged a new cracker into the second glass of mineral oil. When it came out about a minute later, it was hard, seemingly coated in plastic. Within two weeks of discontinuing the mineral oil, Jeske’s skin and scalp problems cleared up. The experience was so profound for Jeske that in 2008, she quit a six-figure endorsement deal with a cosmetic company and began to research natural beauty products. “If people start buying natural and organic products, the movement will grow. There are movies and books coming out on the topic. It’s just going to get bigger and bigger,” she said. For Lorinda Graziano, an instructional aide from Valencia, Jeske’s message rang loud and clear. “You really don’t think about this kind of stuff, but this seminar kind of wakes you up. I’ve always been into health, but now I am definitely going to go through my old products and be more cautious buying my cosmetics from now on,” Graziano stated. 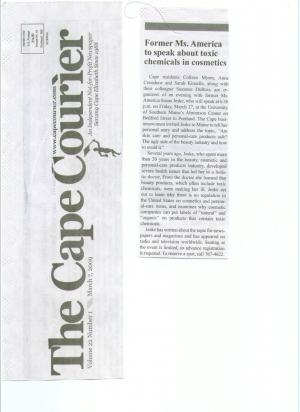 For more information on cosmetic ingredients, visit www.cosmeticdatabase.com or www.safecosmetics.org. Additional reporting by Madeline Rosenberger and Kaitie Byrne. Millions of women put on makeup every day, but you don't think it could be hazardous to your health. 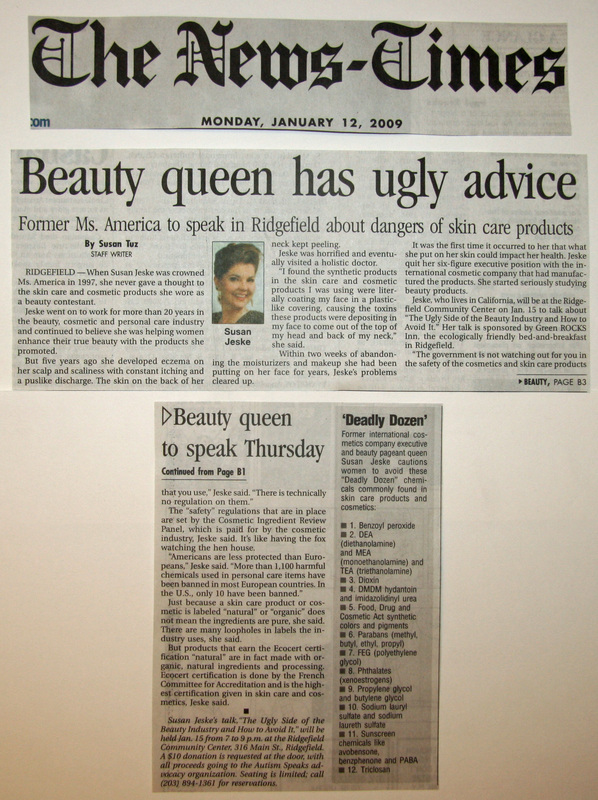 Now a former pagent queen is speaking out -- and telling you her story involving toxic beauty products. 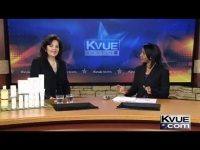 KVUE's Anchorwoman Quita Culpepper talks with former Ms. America, Susan Jeske. Are your Cosmetics and Personal Care Products Safe? PORTLAND — As a former Ms. America with a successful career spanning two decades in the beauty and cosmetics industry, Susan Jeske makes an unlikely advocate for rejecting conventional personal-care products. Seven years ago, she was at the top of the pyramid in an international cosmetic direct sales company, until a health crisis changed everything for her. “You name it, I had it – chronic fatigue, arthritis, weight gain, bad digestion, skin problems,” Jeske said in a telephone interview. After nine gallbladder attacks, her doctor recommended she have her gallbladder removed. She was hesitant after the doctor admitted five of the 35 gallbladder operations he’d performed resulted in complications. “As the nurse was wheeling me away, she whispered to me ‘go find a holistic doctor and do a gallbladder flush,’” Jeske said. She was skeptical, but willing after she found a naturopathic doctor who specialized in gallbladder flushes. The flush appeared to do the trick – “I expelled three cups worth of gall stones,” Jeske said. After triumphantly returning to her traditional doctor, who conducted follow-up tests and declared her gallbladder to be “fine,” Jeske was hooked. She dove into alternative health practices, eating only raw foods for two years, doing numerous organ cleanses and attending courses at the Optimum Health Institute. She got rid of all her health problems, she said, except for her itchy skin and scalp rashes. She went back to the naturopath, who suggested she stop using her conventional beauty products and start using natural, organic products. Two weeks later, her skin problems were gone. Eventually, she quit her lucrative job with the cosmetics company and started an intensive fact-finding mission about toxic chemicals in cosmetics and skin-care products. The information she uncovered was so disturbing, Jeske said, that she felt compelled to start a grassroots campaign about the toxic ingredients in conventional personal-care products. She will share her personal journey and advice on quitting toxic cosmetics in a lecture at 6:30 p.m. on Friday, March 27, at the Abromson Center at the University of Southern Maine. 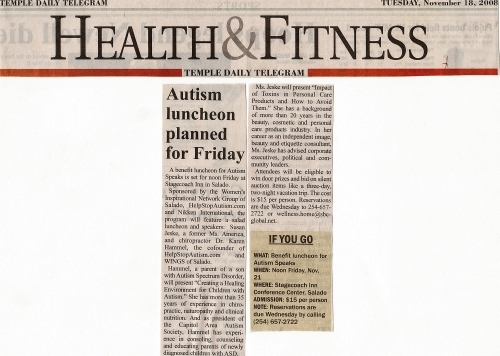 Call 767-4622 to preregister for the event. A major component of Jeske’s platform is to encourage consumers to educate themselves about the risks of certain ingredients commonly found in traditional cosmetics. She disseminates a list of the worst chemicals in personal care products, dubbed “The Toxic 12,” and encourages people to take the list with them when they buy products. Jeske said she is optimistic about consumers wanting to become more aware about green and organic products. She stressed that the best thing to do is to “vote with your dollars” and buy organic cosmetics and care products. After her lectures, she also circulates a petition from the Campaign for Safe Cosmetics asking Congress to support safe cosmetics with stricter testing and regulation. 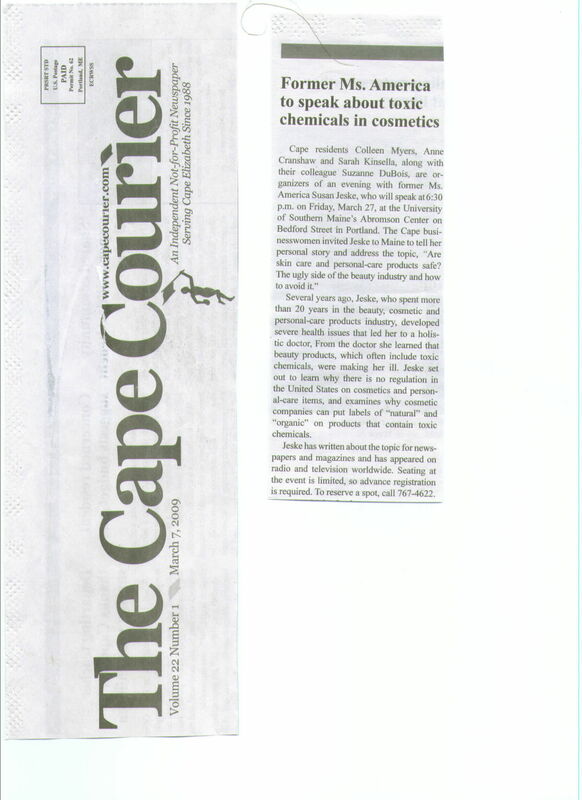 Jeske said she is skeptical about the cosmetics industry “voluntarily self-regulating” and halting the use of inexpensive, but toxic chemicals in beauty products. 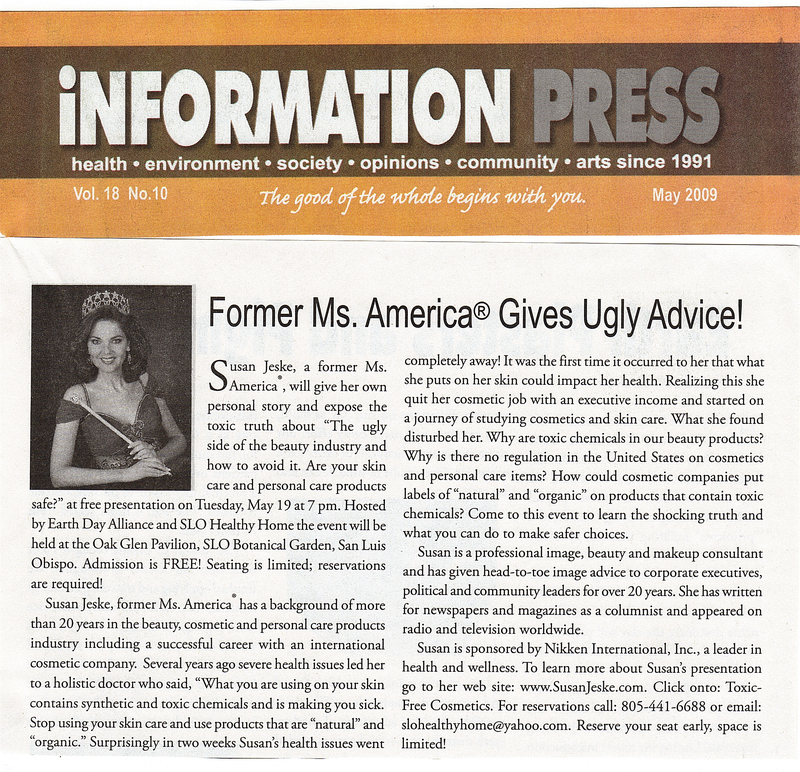 When Susan Jeske was crowned Ms America in 1997, she never gave a thought to the skin care and cosmetics products she wore as a beauty contestant. Jeske was horrified and eventually visited a holistic doctor. "I found the synthetic products in the skin care and cosmetic products I was using were literally coating my face in a plastic-like covering, causing the toxins these products were depositing in my face to come out of the top of my head and back of my neck." she said. It was the first time it occurred to her that what she put on her skin could impact her health. Jeske quit her executive position with the internationl cosmetic company that had manufactured the products. She started seriously studying beauty products. Jeske, who lives in California, will be at the Ridgefield Community Center to talk about, "The Ugly Side of the Beauty Industry and How to Avoid It." 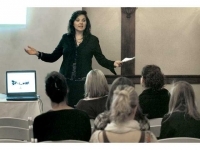 Her talk is sponsored by Green ROCKS Inn, the ecologically friendly bed-and-breakfast in Ridgefield. "The "safety" regulations that are in place are set by the Cosmetic Ingredient Review Panel, which is paid for by the cosmetic industry," Jeske said. "It's like having the fox watching the hen house." "American's are less protected than Europeans," Jeske said. "More than 1,100 harmful chemicals used in personal care items have been banned in most European countries. In the U.S. only 10 have been banned." Just because a skin care product or cosmetic is labeled "natural" or "organic" does not mean the ingredients are pure, she said. "There are many loopholes in labels the industry uses," she said. But products that earn the EcoCert certification "natural" and in fact made with organic, natural ingredients and processing. EcoCert certification is done by the French Committee for Accreditation and is the highest certification given in skin care and cosmetics. Jeske said. 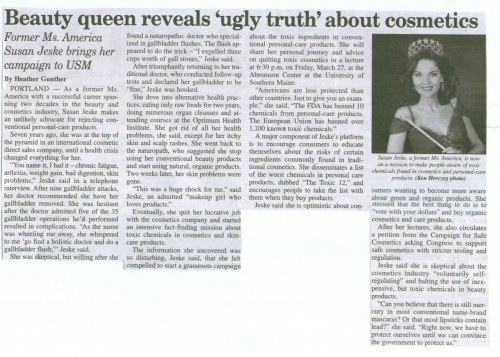 Former Ms. America Susan Jeske will be at Sarasota’s Ritz-Carlton tomorrow sharing her personal health story as it relates to… cosmetics, what else? Jeske, who is 47, a Californian, and won the crown in 1997, travels the country making a pitch for organic makeup and beauty products, recounting how her own mineral-oil based routine caused a severe skin irritation. Jeske uses 42 beauty products a week and has found suitable organic alternatives for everything but mascara. At her talk on Sunday she’ll pass out a list of to steer clear of. Also — beside the point but fun — Jeske holds the world record for singing the Star Spangled Banner at the most official events in a 24-hour-period. It was July 4, 1992. She traveled 393 miles through her home state of California and sang at 17 gatherings. Would You Believe Your Skin Care Products Are Dangerous? Believe Ms. America. 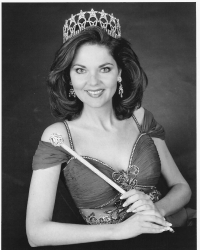 If you’ve heard of Susan Jeske you would know that she was crowned Ms America in 1997. She has spent over 20 years as a beauty consultant working for a major cosmetics company. But now she spends her time on speaking engagements warning us of the dangers of personal products such as cosmetics and skin care products in promoting the benefits of natural skin products and natural cosmetics. What happened to Susan? 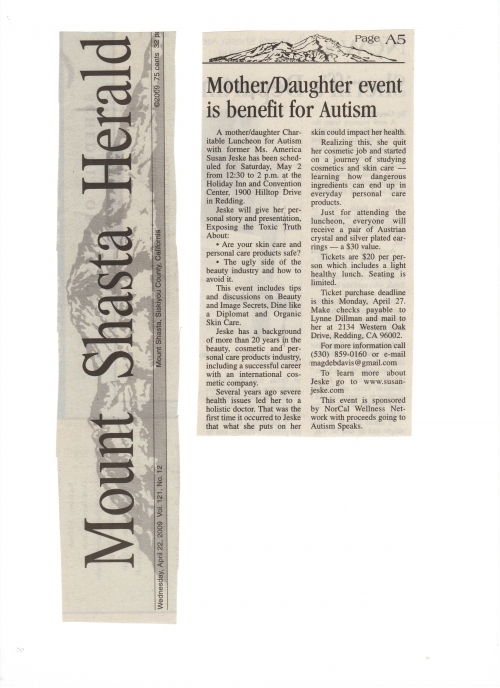 Several years ago Susan Jeske was experiencing some severe health problems and skin problems. Unable to deal with them successfully she consulted a holistic doctor who advised her that the likely cause was chemical ingredients in the cosmetics and skin care products that she was using. She stopped using these products and within 2 weeks the health problems disappeared. I’m sure this was a terrible shock to someone who had spent a large part of her life working for a cosmetics company as a beauty consultant, however she was awakened to the rude fact that so many mainstream cosmetics and personal and beauty products are laced with chemical ingredients. Many of these chemical ingredients are totally banned in Europe but few are banned in America. Some of these ingredients are known to cause cancer and some of these ingredients were also causing Susan’s own health problems. As a result of her researches Susan left the cosmetics company. Now she spends her time touring the country warning consumers about the risks of toxic chemical ingredients in personal and beauty products such as cosmetics and skin care products. Susan even put together a list of 12 toxic ingredients to look for on the label of any product that you intend to buy to put on your skin. If you see any of these ingredients don’t buy the product. There are many people, myself included on my website, that have been warning of the dangerous ingredients used in personal, beauty, skin care and other products for many years. These include a range of nasty chemicals and petrochemicals, and the FDA is not required to control this and does not do so. Therefore the problem gets worse. Most of these chemical ingredients are used because they are extremely cheap and by using them the companies can dramatically increase their profit margins. And the sad fact is that there are outstanding natural ingredients used in natural skin care products and natural cosmetics. These products are available now and use safe non-chemical ingredients which are very effective and which pose no health risks. However because these ingredients are more expensive than chemical alternatives they are not used in the mainstream products. It’s perfectly possible to buy high quality natural skin care products and high quality natural cosmetics right now. Small niche companies see an opportunity in manufacturing these products and marketing them to consumers who are aware of the risks with big brand skin care and cosmetics products. 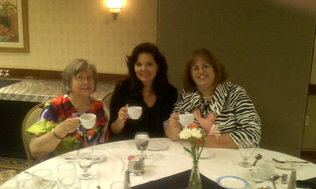 If you visit Susan’s website: www.susanjeske.com, you will find out more details about her speaking tour. Susan Jeske, a former Ms. America, will tell her story in a presentation on the topics, "Are Your Skin Care and Personal Care Products Safe?" and "The Ugly Side of the Beauty Industry and How to Avoid it." She will detail the incidence of lead in lipstick, mercury in mascara and carcinogens in baby shampoo among other potential hazards to health. Jeske suffered severe health issues several years ago and went to a holistic doctor who steered her toward natural and organic skin-care products. She is now a spokesperson for Nikken International Inc., a Swiss organic skin-care line. 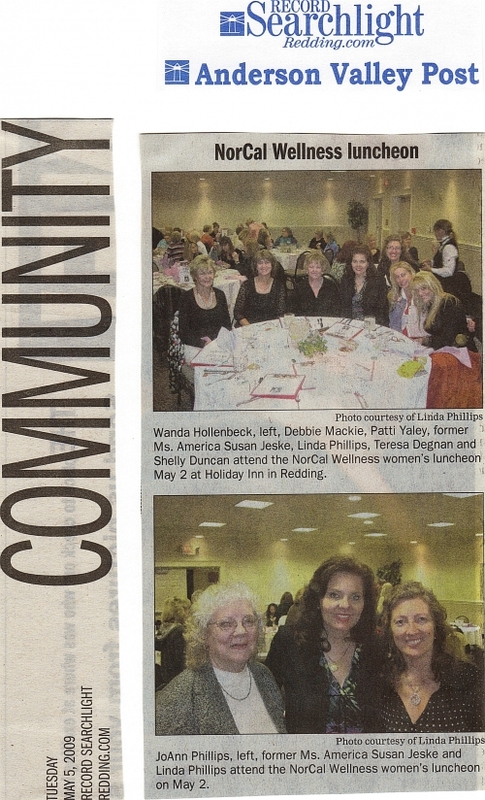 Locally, the products are sold through a network of home-based businesses that are sponsoring the event. The businesses that comprise the Tidewater Wellness Group advocate for the "5 Pillars of Health" — mind, body, family, finances and society — and sell a variety of products, such as sleep systems, shower filters and nutritional supplements. "We just promote wellness," says Donald Schenk, a member of the group. Everyone who attends will receive "The Toxic Twelve" list, detailing the dozen worst ingredients commonly used in skin-care products. Correspondingly, they'll learn what to look for on labels; the industry definition of "organic" and "natural" and what ECOCERT certification means; and they'll receive recommendations for products that are safe and beneficial. The event is at 1 p.m. Saturday, Jan. 23, at Point Plaza Suites & Conference Hotel, 950 J. Clyde Morris Blvd., Newport News; Though admission is free, registration is requested by Jan. 20. Call Donald Shenck 656-9355, or send e-mail to n3woe@yahoo.com. For more product information, go to www.susanjeske.com or nikken.com. From left: Carolyn Hall, former Ms. America Susan Jeske and Ann Taylor of Autism Services of Mecklenburg County attend a luncheon on Sept. 10 at the Marriott Charlotte Executive Plaza hosted by Carolina Wellness Association and Verdun Communications. Jeske, the guest speaker, gave a talk on "The Ugly Side of the Beauty Industry and How to Avoid It: Are Your Cosmetics and Personal Care Products Safe?"